The medium-sized transportation company, T. Shepperson Contracting in St. Neots, near Cambridge in the UK, has chosen a Unimog U 423 as a tractor unit for various transportation tasks. The U 423 has a 5.1 l 4 cylinder diesel engine with an output of 170 kW (231 hp) which it delivers to a transmission with 8 forward and 6 reverse gears. The determining factor for the purchase was the comparison of fuel consumption in the Shepperson fleet with that of other tractor units and tractors; the Unimog won hands down. On average, the U 423 consumes 30 l less per day, which is (at current fuel prices in the UK) about £1,250 ($2,150) per month. 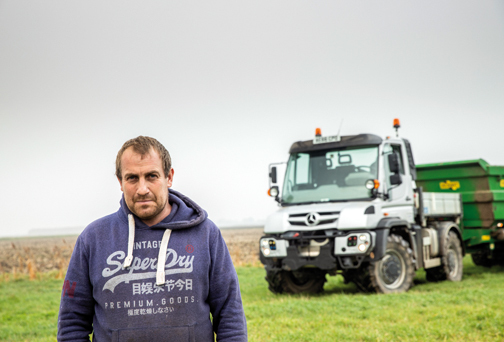 Tom Shepperson, the company's boss, uses his new vehicle for various haulage tasks: from the transportation of excavated earth to agricultural operations and the delivery of waste oil to waste disposal facilities.